insoluble and so unavailable to plants (Fig. 2.3). Neutral to acidic soils, such as the brown earths, often possess mull humus (where the humus is mixed with the mineral soil, primarily by soil animals - see Section 2.2.2) and may be quite rich in calcium ions adsorbed by colloids of the clay-humus complex. Calcium carbonate is especially abundant in rendzinas, alkaline or nearly neutral soils whose organic A horizon rests directly on calcareous parent rock. Soil texture is also important in differentiating how different soils behave. The three important size ranges of particles are clay (< 0.002mm), silt (0.002-0.02mm) and sand (0.02-2mm). Different combinations of these three soil components and their interaction with organic material important in their aggregation create the range of soil textures from fine clays to coarse sands. Sand is important for drainage but in terms of effect on plant nutrition, the clay component is the most crucial. Clays are normally 'secondary minerals': that is, formed from minerals dissolved in the soil water. Along with some of the humus, the clays form colloids, suspensions of particles too small to settle out. Both these inorganic clay colloids and the organic humic colloids have a very large surface area and also have a net negative charge on their surface. The negative charge means that cations (positive ions that include many of the essential plant nutrients such as calcium, magnesium and potassium) are absorbed from solution and, as conditions change, can be exchanged for others. The total amount of exchangeable cations that a soil can hold is measured as cation exchange capacity (CEC) or base exchange capacity. Broadleaved trees normally require soils richer in cations than do conifers. Base saturation is a measure of the extent to which soil exchange sites are filled by cations or bases rather than aluminium or hydrogen ions. Basic soils are rich in alkaline minerals, especially the cation calcium, and are typically rich in other nutrients as well. The dominant exchangeable cation in temperate soils is calcium, which causes clay particles to aggregate into stable lumps: Ca clays are flocculated. 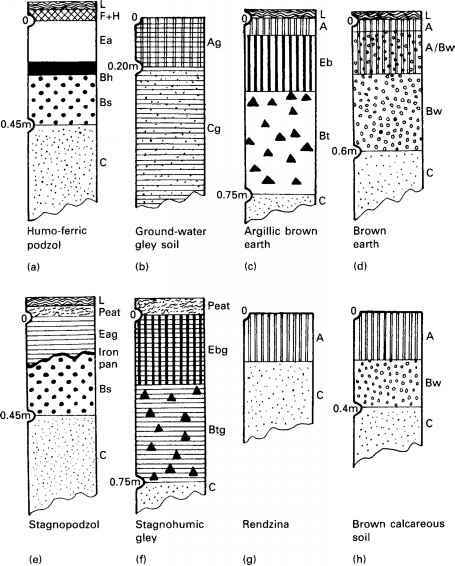 In contrast sodium (Na) clays, which form when the sea penetrates coastal barriers and in depressions in arid zones, are highly dispersed into very small particles and percolate down the profile in suspension (illuviation). Such a 'clay shift' can also occur under other conditions, especially in neutral or slightly acid soils. However, the presence of free bicarbonate ions (HCO3) inhibits such movement in more alkaline soils, while aluminium and dissociating ferric hydroxide (Fe(OH)3) do so in acidic soils. Soil colour is greatly affected by the presence of sesquioxides, the free oxides and hydroxides of iron, aluminium and manganese, which tend to coat sand particles. 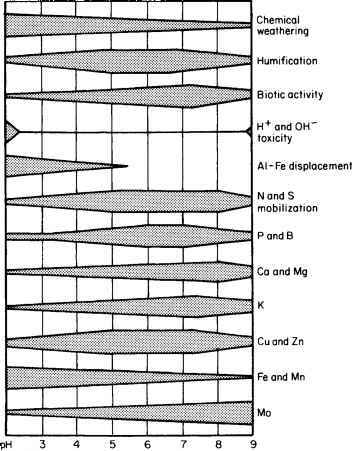 Partial or occasional waterlogging can dissolve these oxides, however, leading to an iron pan formation lower in the soil profile (see below and Fig. 2.1). Soils of the humid tropics are generally red or yellow because of the oxidation of iron or aluminium, while the combination of organic matter and iron oxides gives the brown colour typical of many temperate soils. The amount of water available also makes a big impact on forest soils, especially when they are acidic. Podzols (meaning ash-like) are base-deficient, strongly acid and often support conifers. They develop relatively rapidly on acidic sandstones, gravels and other permeable parent materials when substantial amounts of water are available for leaching. Soils developing over acidic rocks have few earthworms (mostly absent in temperate soils below pH 5.0) and so develop a thick layer of relatively undecomposed mor humus on top of the soil (see Section 2.2.2). This is reinforced by the nutrient-poor, decomposition-resistant litter of the northern conifers and other evergreens typically associated with this type of soil in a circumpolar belt. Note though that if climatic conditions are wet enough with sufficient downward leaching, a peaty layer of mor humus will even form on boulder clay and other substrata. Water passing through the surface humus becomes so acidic with dissolved humic and carbonic acids that it can strip the iron and aluminium oxides from the underlying mineral particles, leaving a layer of quartz sand grains bleached to an ashy grey colour (an eluvial Ea layer). Quartz grains remain, often accompanied by some secondary silica. 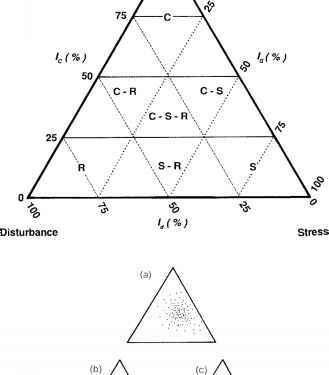 As the influence of mor humus increases and leaching becomes stronger the Si/(Al + Fe) ratio rises. As conditions change further down in the soil, the mobilized oxides and illuviated humus are deposited to create an orange or red-brown tiger-stripe (Bs) horizon or even a hard humus or iron pan (Bh) typical of the humus-iron podzols ((a) in Fig. 2.2). These pans can be impermeable enough to hold a perched water table, leading to waterlogging of the surface. Long periods of waterlogging cause soils to become anaerobic and lose the bright red and ochre colours caused by the presence of ferric iron. Iron and manganese are reduced to ferrous and manganous forms, which are soluble and more mobile. If such gleyed soils, which are very common in low-lying areas and valleys, undergo seasonal drying, re-oxidation causes black manganese concretions and the yellow and rusty spots associated with ferric iron. Gley (g) horizons are often neutral or mildly acid, besides being normally deficient in phosphate. Stagnopodzols (peaty-gleyed podzols, (e) in Fig. 2.2), which possess a thin dense iron pan and a layer of peat, are very common in upland Britain and similar wet environments. In addition to water, climate as a whole makes a big difference to soils. The British Isles exemplify this nicely. There is a strong correlation between the soil regions of Britain and the five climatic regimes defined by Burnham (1970) on the basis of mean annual precipitation (over or under 1000 mm), and mean annual temperature. Very cold was taken as under 4 °C, cold as 4.0-8.3 °C, and warm as above 8.3 °C. Clay eluviation under the warm, dry regime results in argillic (leached) brown earths ((c) in Fig. 2.2)thathavepreviouslybeenusedfor agriculture rather than forestry. Attitudes are changing and we may well in future establish plantations on the better soils. This eluviation process is initiated by the summer dryness so common in south and east England. Early winter rains bring clay particles near the surface of the soil profile into suspension. These are washed into the subsoil, in a mechanical eluviation process called argilluviation (arg = clay, luviation = washing), and the water is drawn into the dry lumps of soil (peds) leaving clay films on their external surfaces in a clay-enriched horizon. Under a cold, dry regime (found, for example, in parts of north and east Scotland, the North York Moors, and areas on the eastern slopes of the Pennines) rainfall and potential evaporation are both low so what water is available tends to leach down through the soil. Parent materials in these areas are of low base content, so most soils are acidic, have mor humus and podzolization is widespread. On lower ground where the organic matter is more decomposed and integrated into the A horizon (mull humus or a less integrated transitional moder) soils tend to be less acidic and podzolization is not as strong. These sites, which originally would have supported oakwood, show intergrades (semi-podzols = brown podzolic soils) between brown earths and podzols. Heathlands now occupy most of the podzols on higher ground but, before the combined influence of climatic change and human interference, pinewoods were frequent here. Under the warm, wet regime of south-west England, most of Wales and coastal areas in north-west England and south-west Scotland, there is a high degree of leaching but the warmth leads to more biological activity. Over acidic rocks weak podzolization can occur in places. Mostly, however, the litter dropped by plants is nutrient rich and easily decomposed, and the active soil fauna, especially earthworms, readily mix the humus into the mineral soil to create a neutral to moderately acidic (pH 4.5-6.5) brown earth ((d) in Fig. 2.2). Until cleared for cultivation almost all the area under this climatic regime was covered by deciduous woodland. Trees, especially of Sitka spruce Picea sitchensis, are planted quite extensively on some of the better acid brown earths and forest yields are high, although some of the more podzolized areas often need deep drainage ditches. The acidification of brown earths is helped by leaching by rain leading to a lower pH and calcium content at the surface than further down the profile. This surface acidification is particularly obvious where parent materials are uniform as in Hayley Wood, Cambridgeshire, whose soils are derived from chalky boulder chalk with a small admixture with loess (Rackham, 1975). Areas with a cold, wet regime are covered by stagnopodzols. Here a deep layer of undecomposed litter builds up leading to intense podzolization and often waterlogging. The humus layer, aided by wet conditions, may become thick enough to be called peat. Such soils coated with peat on all but the steep slopes are classified as blanket peats characteristic of a cold, wet regime. Most of these areas are too exposed for tree growth and forestry. More favourably sheltered areas often require ploughing to mix in the surface peat layers and improve drainage before trees can be planted. Leaching is strong and weathering weak; and so the recycling of nutrients is slow. Fertilizer additions, especially of phosphates, considerably improve tree growth. Sitka spruce, sometimes planted with lodgepole pine Pinus contorta, grows well under these damp conditions, and is very successful in less exposed parts of this region. In contrast, the alpine humus soils developed under very cold, wet conditions are near or above the natural treeline in Britain and have never been forested. The British Isles are relatively small and so do not show the even greater diversity of climate associated with such areas as North America or Eurasia. Here variation in rainfall, potential evaporation, irradiation, temperature and length of growing season lead to major differences in the soil types and vegetation present. The most striking of these different climates are those of the wet tropics. What is the Soil Profile for tropical rainforest? What is soil profile and properties?